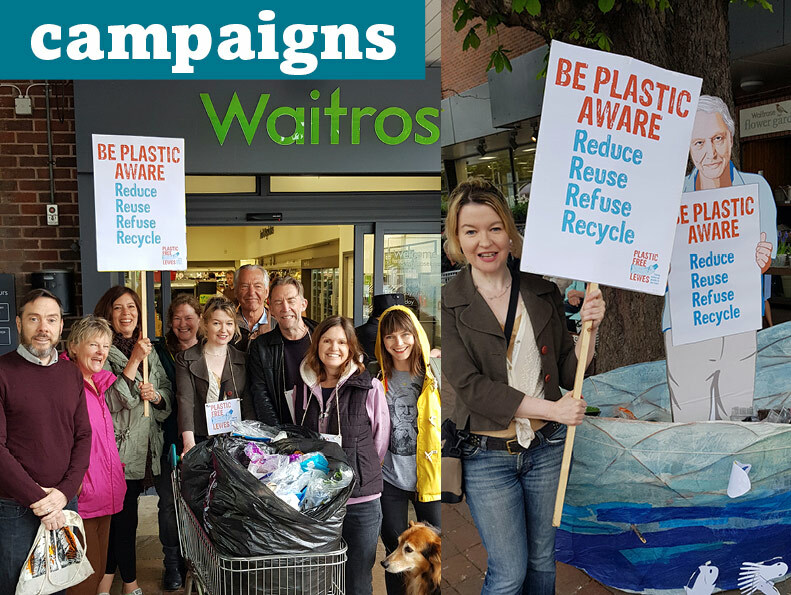 Sir David Attenborough made an unexpected appearance at Waitrose in Lewes on Saturday 12 May, when a lifesize cut-out of the famous naturalist was used by Plastic Free Lewes to help urge shoppers to “unpack the plastic”. 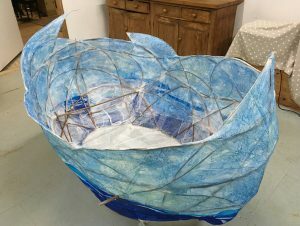 For this Unwrap the Plastic event I made a withy and tissue ‘sea’ to collect all the plastic rubbish and a cardboard cutout illustration of David Attenborough, who was up to his knees in plastic by the end of the event! 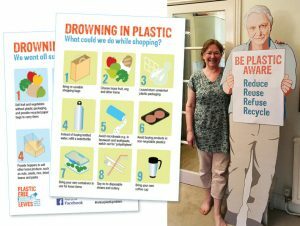 I designed some flyers to hand out on the day, with ideas on what shoppers can do, and action we want all supermarkets to take. 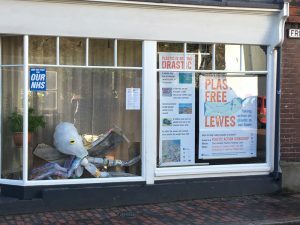 Below: Ollie the octopus has put in a few appearances around Lewes now, beginning with the Tourist Information window, then on to Friars Walk and most recently in the Hugh Rae window. I made this octopus from plastic junk to draw attention to some information displays, he’s proved quite popular with passers-by. I also designed the logo for Plastic Free Lewes, commissioned by Transition Town Lewes.